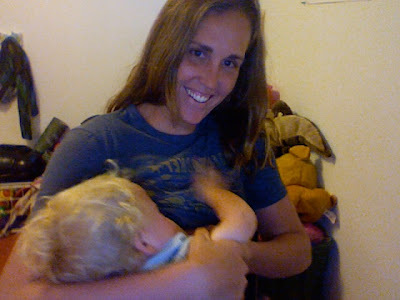 I'm officially nursing a toddler, and enjoying it. We have our trying moments, but for the most part, neither of us is ready to give it up, so here we are. It's nice to have the World Health Organization make supportive statements such as, "Exclusive breastfeeding is recommended up to 6 months of age, with continued breastfeeding along with appropriate complementary foods up to two years of age or beyond." It helps to validate what I already feel instinctively. I know nursing a toddler is good for me and the babe. I've read many times that as babies get older, the composition of the milk changes to meet their growing needs. A nursing toddler still receives all the antibodies and disease-fighting immunities, along with whatever vitamins his growing body needs. Human milk is so amazing! And for me, burning lots of calories, and delaying my menses, is nothing to complain about. Nutritional benefits aside, when I look down at my nursing 17 mos old, I see this look of pure contentment in his eyes. It's a look I can't really describe, but I feel in my heart that he is so at peace with life when he is nursing. This past week Odin has been sick, plus teething on top of that. His one, single source of comfort has been nursing. I love it when he comes running to me, worried and sad, arms open wide, knowing exactly what will make him feel all better. Nursing a toddler is humorous. I should think you need a sense of humour to handle the startling changes of nursing a walking, talking, thinking child. No more are they the small, still, iconic baby, staring lovingly into your eyes. Odin twists, twirls, kicks, squeezes, stands up on my lap, and makes the silliest of noises, while he....eats. I can't walk around the house shirtless, without his eyes getting real big, and immediately wanting to nurse. I feel like the giant, walking steak, in those old cartoons. It makes me laugh. 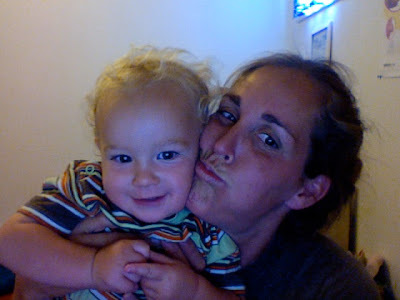 Nursing a toddler isn't just a lifestyle choice, it's an emotional and physical need. We need each other, and we're not ready to wean. I'd say, we're pretty attached. What a sweet post! And oddly timed for me, as Owen hasn't nursed since Sunday morning. At 2 years and nearly 5 months, I think he's done. I know it's time, but I already miss watching him snuggle in. My toddler is still nursing but he's a young toddler - 13 months. Good for you, Sally!! This is awesome Sally! And so great you have a photo of him squirming around. 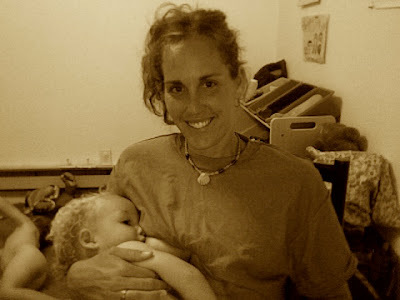 We don't have one of those - there's a few kinds of photos we don't have of her breastfeeding. I need need need to do that before she weans. It goes by so fast! (Still nursing at 28 months and doing so with a smile).